Countdown To The Fourth — Ash & Ash Co.
We are officially seven days out from Independence Day!! This patriotic holiday is celebrated loudly & proudly and we have all of your outfits to be sporting on this day. Fun fact about us is that we screen print and make custom sewn pieces for any and all occasions! We have America themed cuffs, headbands, and beaded bracelets. We have got it all from head to toe no matter what you're looking for this holiday! Something that we like to do with new product is lay it out and outfit it so we can give you guys an idea of how we would wear it and what we would pair the pieces with. These are just a few of our fourth looks that we have put together at both locations. Living in Nebraska we can never predict the weather, so we are prepared for whatever Mother Nature throws at us! Accessorizing is key for any outfit whether it is a headband, hat, necklace, or bracelets. We like a little mixture of it all because it can really pull the total look together. If you haven't heard already we have started carrying Ruby Red Threads headbands and they are flying out of here. They are handmade locally right here in Lincoln and we love them! 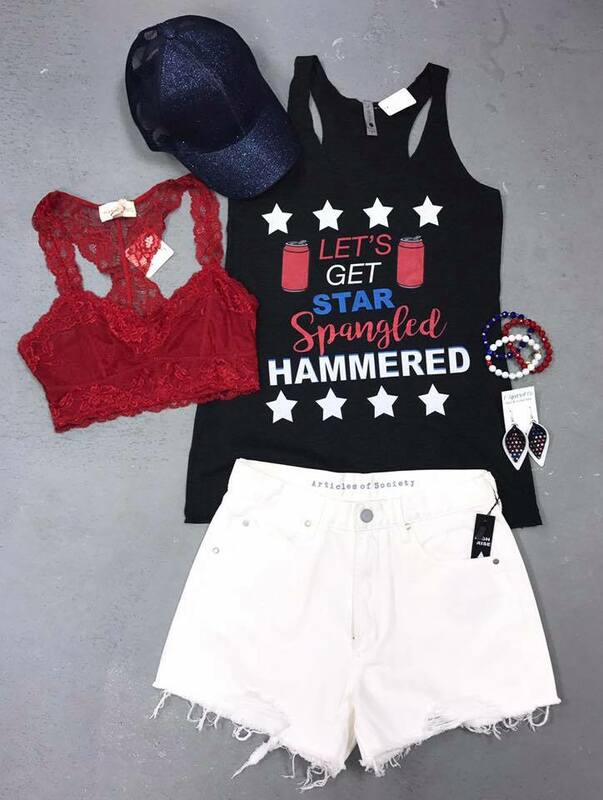 Come on in and see us to get outfitted for this Fourth of July! We hope you all have a safe and fun holiday! Thanks for reading!